For some companies, even a few hours of downtime can become a business disaster. IT risks must be considered as serious as any other significant business risk. When was the last time you assessed your business risks? 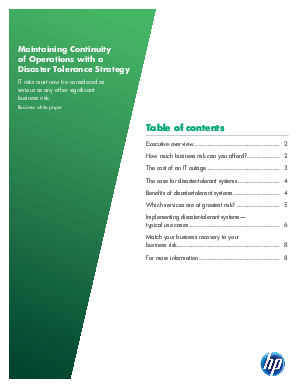 Download this HP white paper to learn how to reduce the financial impact and maintain acceptable levels of productivity during an unplanned disaster.